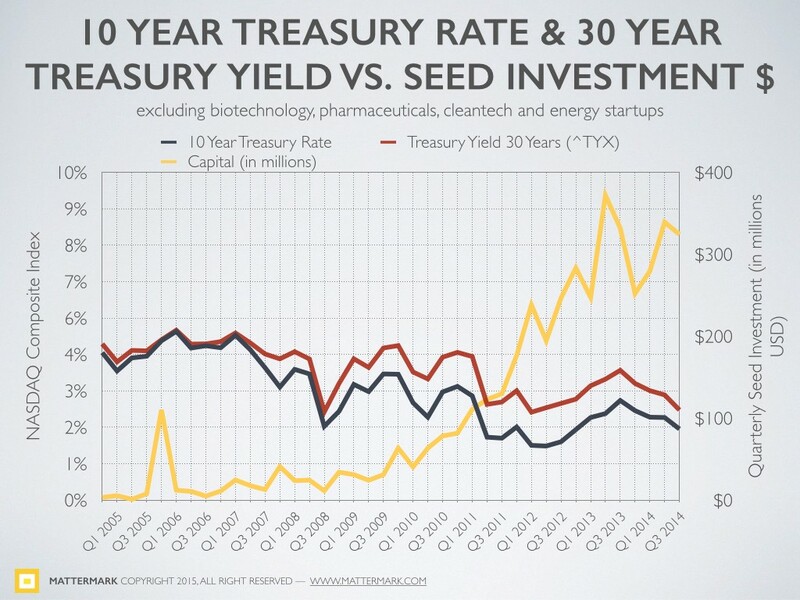 All analyses in this report are for U.S. seed investments as reported in Mattermark — The Deal Intelligence Company, and exclude companies in the following categories: biotechnology, pharmaceuticals, cleantech, and energy. While some investors told me they felt volume and valuations were at an all time high, other highly credible sources confirmed the data echoed a trend they were also seeing with a high volume of seed transactions. Without the quarterly breakout it is difficult to discern the downward trend in 2014. 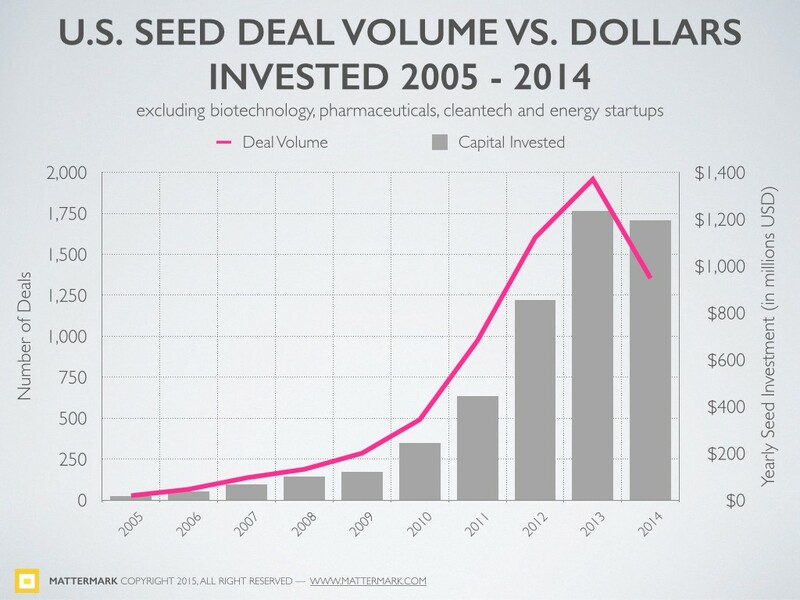 On the whole, seed investment dollars in 2014 looked very similar to 2013 but the number of deals dropped 30%. This drop in number of deals, without a similar decline in investment dollars, indicates that the average seed round in 2014 was larger —in turn suggesting the valuation or valuation cap of the average round increased. 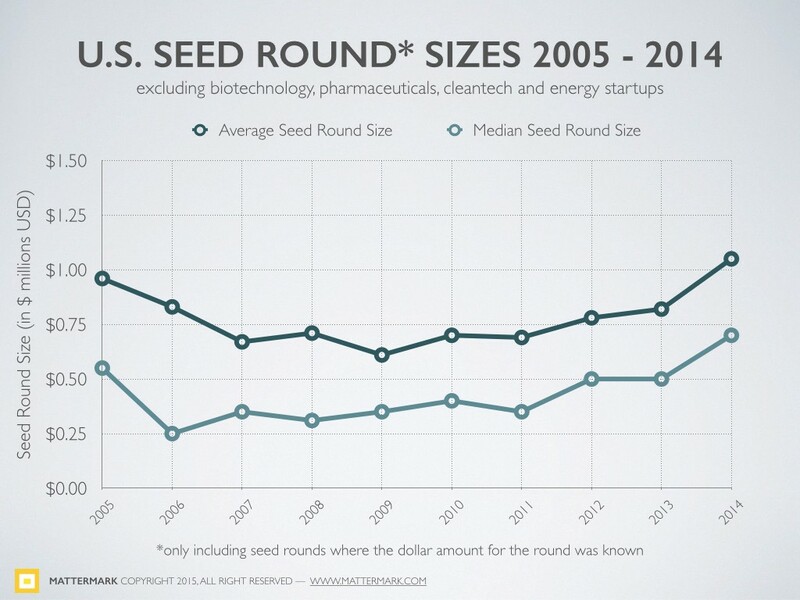 And indeed, the average seed round rose 28% while the median rose 40%. Startups continue to receive what Fred Wilson called “eye popping EBITDA multiples” in his March 2014 post “The Bubble Question”. Fred goes on to explain the connection between artificially low interest rates resulting from the U.S. central bank’s reaction to the 2008 financial crisis, and the picture he paints is a story of investors’ struggle to find decent returns in a low interest rate environment where money is cheap and undifferentiated. With this guideline in mind, we can get some understanding of the key drivers for startup investment volume on the whole — which from a dollars perspective is at an all-time high. I’ve focused on the changes in the seed funding landscape because these are things that will impact the ecosystem 2 to 5 years from now as these companies progress into later rounds of funding and exits. This is the pipeline for VC dealflow. 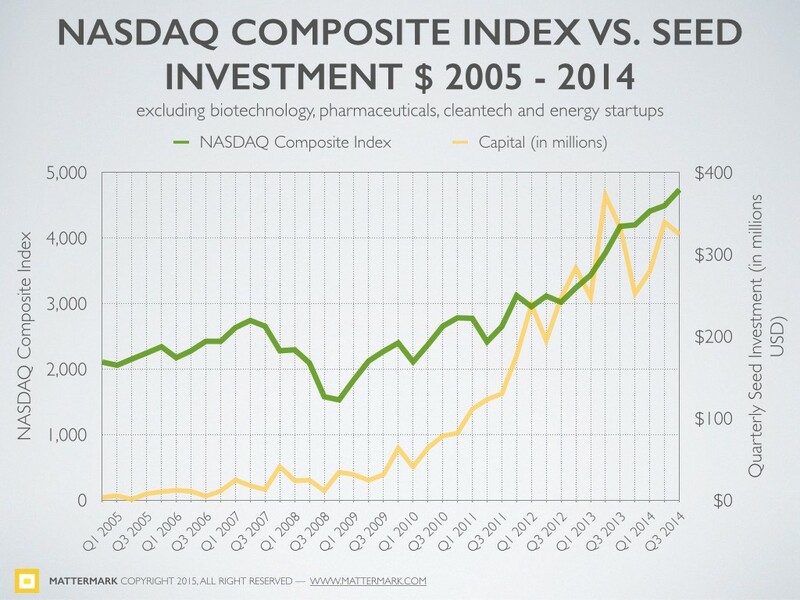 Source: Nasdaq Composite Index — Yahoo Finance. Board of Governors of the Federal Reserve System (US), 10-Year Treasury Constant Maturity Rate [DGS10], retrieved from FRED, Federal Reserve Bank of St. Louis https://research.stlouisfed.org/fred2/series/DGS10/ January 15, 2015. Board of Governors of the Federal Reserve System (US), 30-Year Treasury Constant Maturity Rate [DGS30], retrieved from FRED, Federal Reserve Bank of St. Louishttps://research.stlouisfed.org/fred2/series/DGS30/ January 15, 2015. This is the place where I pause and remind you that correlation, no matter how strong, does not make a case for causation on it’s own. Instead, we use domain knowledge and the opinions of experts like Fred Wilson to explore the causal connection between interest rates and the availability of capital to start new ventures. Predicting the future is not the goal here, it turns out describing and understanding the world as it is, is quite challenging enough. The large drop in Q4 is interesting for several reasons. First, there is a seasonal effect to startup funding and you can see from the final graph that Q4 tends to see a decline or at least plateau in financings each year. However, the steep decline might also be investors (over? )reacting to mounting concerns about valuations and economic correction related to tapering of central bank activities. What To Expect in Q1 2015? Are seed financing by high net worth individuals a leading or lagging indicator of the economy’s health on main street? 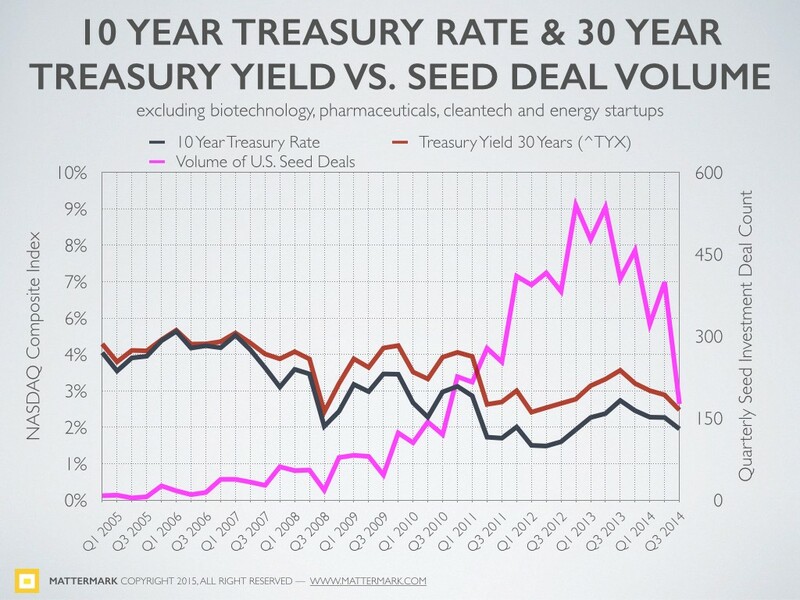 Are institutional seed rounds really just a Series A with a different name? What does this mean for the volume of venture rounds further down the pipeline, and the dearth of new funds coming on the market? Thank you to Sarah Catanzaro, Joshua Luxton, and Alex Wilhelm for reviewing drafts and providing feedback on this post. To pre-order our research report on U.S. startup investment over the past 10 years please visit our website and place your order for Feb. 2, 2015 delivery. Methodology Note: All analyses in this report are for U.S. seed investments only and excludes companies in the following categories: biotechnology, pharmaceuticals, cleantech, and energy. Sources: This article was compiled with information collected from Mattermark, AngelList, Crunchbase, FRED — Federal Reserve Bank of St. Louis, and NASDAQ. To learn more and access the raw data used to generate this post, sign up for your free trial of Mattermark professional today.